The most inherent difficulty in fantasy football has been, is, and always will be the air (or lack thereof) of consistency. Fantasy owners struggle, and have struggled, with finding some kind of accuracy, some sort of fortune-telling ability whether it be of real-football analysts, fantasy-football analysts, statisticians, coaches, psychics, and any other number of sources. The problem is that, by its nature, the unpredictable is impossible to predict. Minimizing unpredictability was the driving force behind many articles in the pre-seasons, the most prominent of which was Matthew Berry’s Draft Day Manifesto. 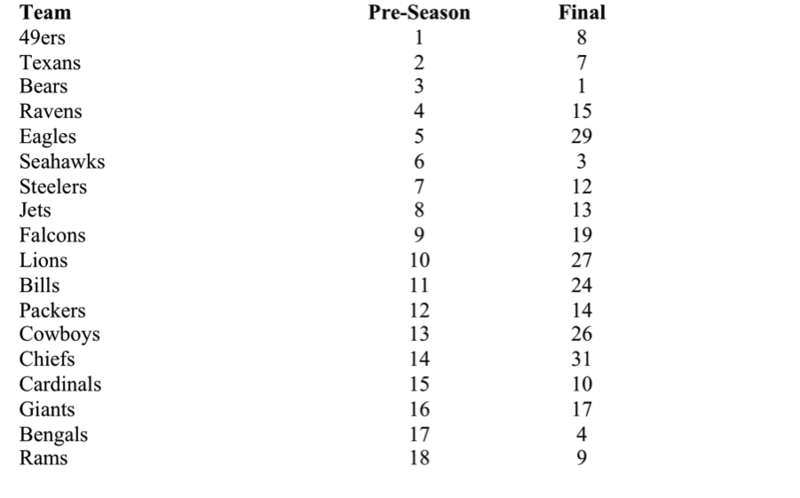 In it, there was specific reliance on a statistic: more pre-season top ten quarterbacks finish top ten than at any other position in the league. JJ addressed, in his book, the flaws of this argument – specifically that the tenth best quarterback was barely startable in a ten or twelve team league, but the tenth best running back was almost definitely startable in a ten or twelve team league (because twenty four running backs, at least, start every single week in a twelve team league…compared to twelve quarterbacks in a twelve team league). But there’s a separate flaw in this line of thinking. The way to think about rankings and their accuracy is not to consider how many guys start and finish top ten. 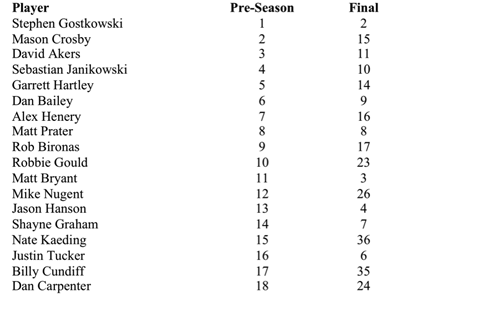 Rather, it’s how close a guy finishes to his pre-season ranking. A guy who starts one and finishes ten (as Michael Vick did on a points per week basis in 2011) is vastly different than a guy who starts ten and finishes number one. Counting these two as the same or similar “wins” grossly misstates the relative value of each. The question, for me, is not how well experts (or anyone) picks his or her top ten, it’s how close his or her first quarterback finishes to first overall, second to second, and so on and so forth. Through the power of math (hooray math!) we can find out exactly how well an expert in the preseason ranked quarterbacks, running backs, and every other position. A neat little trick you might have learned in your Statistics 101 course in college was a function called “correlation”. What correlation does, as simplistically as I can put it, is find how strong the relationship between two separate values is. So, in our case here we would expect the first ranked quarterback in the pre-season to finish first, the second to finish second, etc. But if QB1 finishes 5, and QB2 finishes 1, and QB3 finished 14, we can measure how strong the pre-season ranking is with the final value. When all is said and done we are left with a value between 1 and -1 called a “correlation coefficient” that tells us how strong the relationship is between the two values. We essentially create a best-fit line through the points on a graph, and measure the slope of the line. A value of 1 means that the relationship is 1:1 in a positive way – as X goes up Y goes up at the same rate (but note not by the same value, necessarily). A value of -1 means that as X goes up Y goes down at the same rate. A value of 0 means there is no discernible relationship between X and Y. Of course, there’s a ton more you can do with correlation, including measuring statistical significance. For the purposes of this article, I simply want to discover whether ESPN’s pre-season rankings at each position tended to be any “better” than any other. 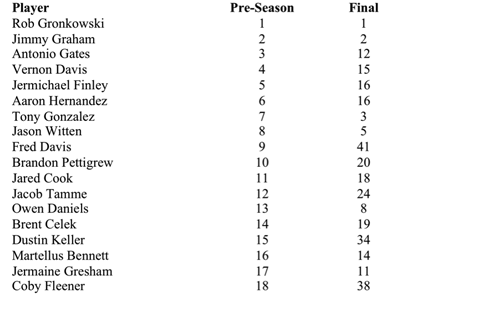 For positions where two players start in a standard league, I will go to thirty-six (taking the first thirty-six players in the pre-season rankings). For positions where one player starts in standard leagues, I will go to eighteen. This should more or less account for draft need at every single position. Additionally, I want to say up front that I realize positions where teams generally carry fewer players (e.g. carrying five wide receivers to two tight ends) are less subject to fluctation. 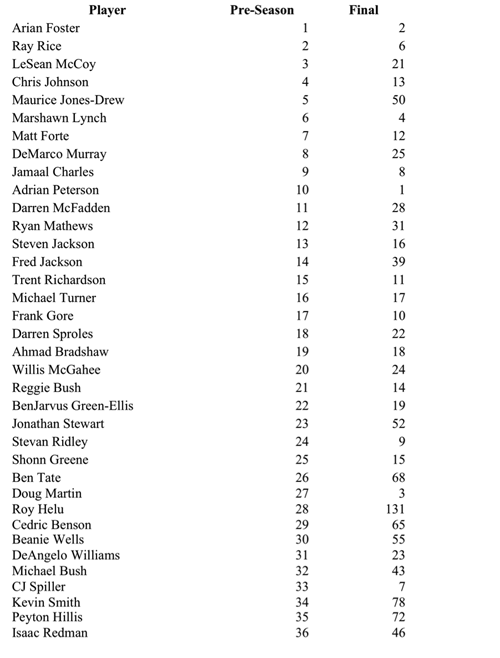 It is unlikely a tight end will be the 100th TE in the league, because there simply are not 100. But I believe that’s part of the predictability angle. That is to say, if we know it’s unlikely a tight end will plummet above 40, 50 or 60 other tight ends who move up above him, and it IS likely that a wide receiver would drop behind 50, 60, 70 guys ranked behind him, that’s part of understanding how predictable each position is. What I am trying to do is measure volatility on a league-wide scale at each position. The threat of many other guys surpassing you at that position IS part of the volatility. The x-axis is each player’s initial ranking, the Y-axis is that player’s final position. You can see that the general trend is upwards, which is to be expected. As a player’s pre-season ranking “number” increases, so too should his final ranking “number”. 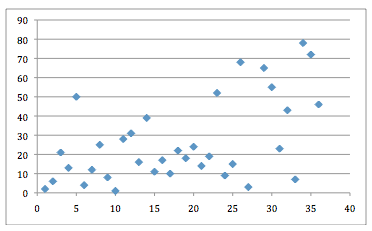 Doing this, I found that the correlation co-efficient for quarterbacks was .52286108. 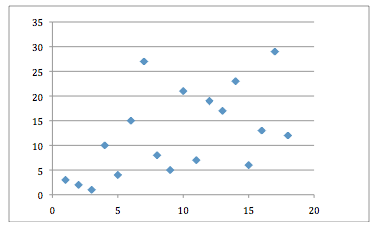 I want to give the caveat that the above graph is without Roy Helu’s wild outlier. Generally you see a similar pattern with quarterbacks. 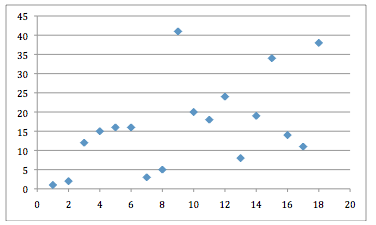 As X increases so too does Y. I ran the correlation with Roy Helu included, in the interests of fairness. That correlation was .50562811. 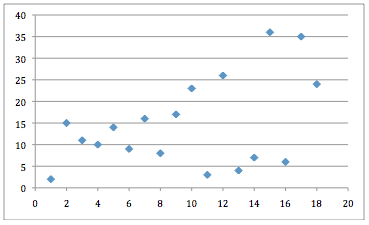 This is slightly, but only slightly, worse that the correlation for quarterbacks. 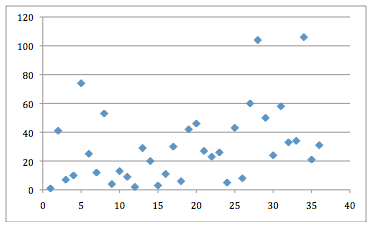 Without Helu, the coefficient jumps to .53213186 (slightly better than it is for quarterbacks. Wide Receiver is where things get quite dicey. That’s actually to be expected in today’s NFL. Whereas in the more wide-open passing NFL, all the passing yardage increases generally go towards the quarterback. But wide receivers more and more are splitting looks with other wide receivers, and second and third stringers emerge more and more as insanely viable and competitive fantasy options. The correlation coefficient here was a paltry .38390637. Things get back to normal at tight end. I’m not sure why this is so for the TE position and the WR position, but my guess is the TE’s role around the league is increasing at a similar clip. Most teams do not carry multiple tight ends to be used in the passing game. As I said above, tight end is going to be generally less volatile within itself. Odds are if you pick a TE top 18, he won’t plummet beyond 30th. In that respect, tight end is safer to draft later. Correlation here was .51298359. 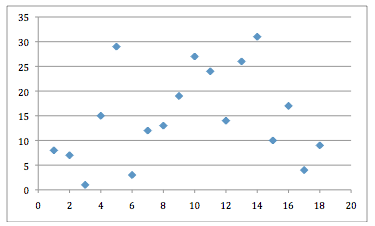 This scatter plot tells us what we already assumed. Defense/ST is almost impossible to project. As a result, we got a correlation of .21054486. 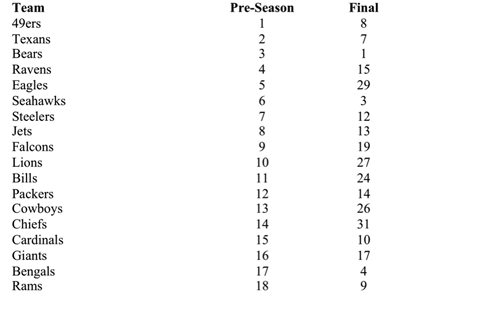 This suggest almost no correlation between pre-season projection and final ranking. This is actually the most interesting chart to me, and not because of my affinity for kickers/kicking. 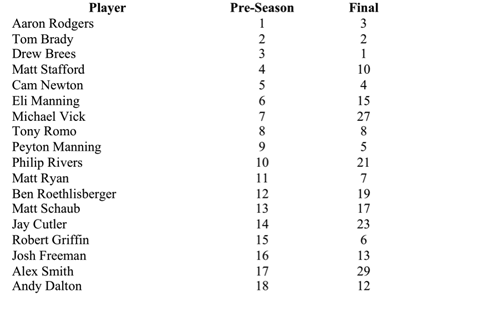 The relationship between kicker’s pre-season ranking and kicker’s final ranking is actually higher than it is for wide receivers at .44655647. We are consistently told that projecting kickers is a near impossible task. What this shows is that the experts are maybe not as bad as it as you think they are. So after all this math mumbo-jumbo…what does all of this mean? The way I read these results is as follows. There are only two positions where you start two to three guys each and every week: Running Back and Wide Receiver. However, wide receiver is a much more volatile position from a rankings stand point. But whether you wait until round 6 to take one, or you grab two in the first three rounds, you have to start three. Of the skill positions, there is significant predictability – QB, RB, TE rankings were all similarly accurate within each position. You aren’t “risking” very much taking a running back over a quarterback in round one (as much as some people would want you to believe). Of course, this doesn’t account for relative value (several including myself have shown early RBs generally have higher value returns than their QB counter-parts), just predictability of position. But in order to solidify two to three starting-caliber wide receivers, according to these numbers you can wait, but you will need to grab a lot of them. Since the rankings are so out of wack with final finishes, in my opinion you are going to want to have a boatload of wide receivers to pick from. Yes, defense is the most unpredictable position by far, but most teams roster one and maybe two on bye weeks. 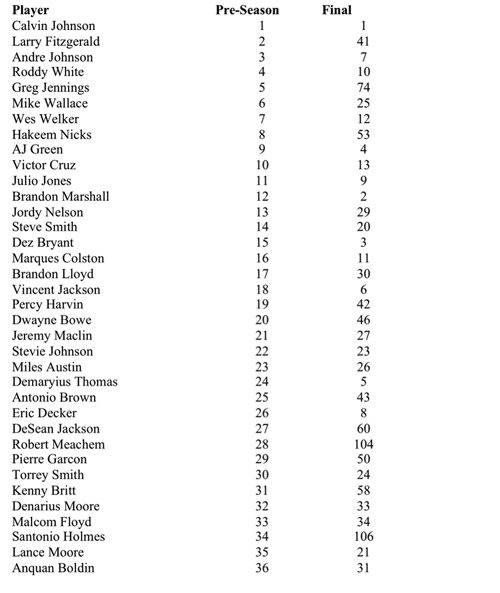 Teams roster at least triple the number of wide receivers on any given week. Thus, it’s much easier to play the waiver wire for a decent (read: top-ten) matchup on a week-to-week basis. Needing to fill two or maybe even three spots with gambles at wide receiver is much tougher. The message, I believe, is this: when filling your bench, value the wide receivers late. You are going to need as many rolls of the dice as possible.